The Lava the Original 14.5-Inch Star Vortex Lamp is perfect for dorm rooms, parties, and more! 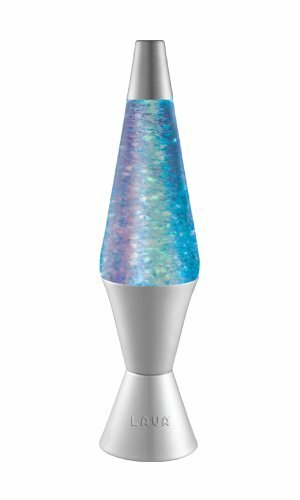 The color phasing, motorized, swirling glitter action creates a sparkling, crystal effect on the glass globe of this iconic Lava the Original lamp. The LED lights change colors magically from blue to green to red. Watch the instant action and enjoy this unique Lava the Original lamp. For over fifty years, the iconic Lava the Original brand has been the pioneer in novelty and conventional lighting products, and today it stands as one of the most recognized, trusted, and beloved brands of all time. At Lava the Original, our commitments to pursuing the latest fashion trends, cutting-edge technology, and unsurpassed quality ensure that we continue to intrigue our older fans while enticing the younger generation with our exciting new product lines. So whether you are six or sixty, we have a Lava the Original lamp product just right for setting the mood of your life. If you have any questions about this product by Lava the Original, contact us by completing and submitting the form below. If you are looking for a specif part number, please include it with your message.